5 STAR HOTEL were first met in the University of Birmingham in 2001. After they have witnessed numerous gigs, they decided to form a group and just after a while they started composing originals and recording demos in various studios. From their very first live appearances, although totally unknown to the most, they stirred the public with their fresh and exciting British pop sound. From then on, they managed to draw the attention of a noteworthy following that gradually was getting increased. The band returns to Greece where they keep playing and rehearsing their own originals in a pop vein with guitars and synths. Their sound is characterized by the velvet and dreamy vocals, which are perfectly bond with the rest of the instrumentation, proving a very talented group of advanced maturity! The band's performance as an opening act to Six By Seven from United Kingdom last February was a unique opportunity to deliver their sound to a wider audience. The feedback received was exceedingly positive, a fact that led ON STAGE RECORDS to include their number "I Want You" in "Enjoy The Greeks" CD compilation. After such a very successful deal, the group steps on to the future with self-confidence and lot of ambition! In the spring of 2005, the band goes into the studio to prepare its first CD single attempt. 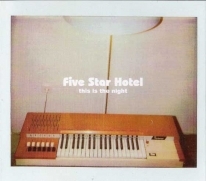 This debut 3-track EP, entitled "This Is The Night" is a perfect mixture of pop, disco, indie and waltz, is expected to amaze listeners and magazine reviewers internationally as it features a completely alternate viewpoint of the modern pop culture in music. The band delivers a superb personal oriented sound with a few hints close to "Pulp" kind of pop and the best period of "The Smiths". Housed in a cool-looking vintage organ, it is destined to be one of your timeless favourite boxes of music! 5 STAR HOTEL weave their own dreamy pop world where the stars are always bright! Welcome in!! !